Disclosure: I was sent samples from the folks at Fisher Price and Candlewick Press, in order to write up an honest review. The views shared are mine and mine alone. I can't get over how popular Peppa Pig has become worldwide. This is one of those shows you think just a niche group of people will tune into. But, instead it has blown up and now there are movies toys, apparel and so many other licensed products available that follows the daily adventures of Peppa Pig, a lovable, energetic little pig, who lives with her brother, George and parents, Mommy Pig and Daddy Pig. 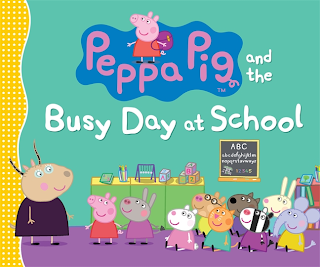 Over the past couple of years, I have had the opportunity to review Peppa Pig DVDs from Entertainment One, books from Candlewick Press and even toys from Fisher Price. My girls love these review opportunities, as they each consider themselves Peppa Pig's number #1 fan. Shh, don't tell them that there are so many others out there who love this spunky talking pig. 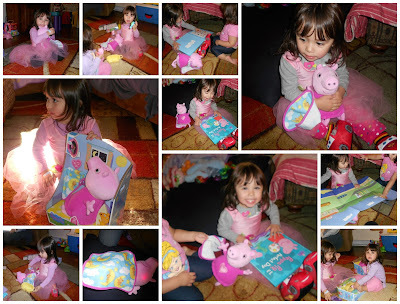 :-) So, when I was recently contacted and asked to review new Peppa Pig toys and a book, how could I say "no?" Within a few days of accepting the review opportunity, I received the following Peppa Pig items in the mail from the folks at thanking Fisher Price and Candlewick Press. 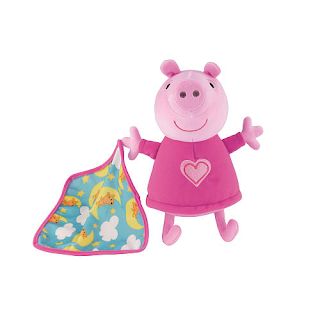 Bedtime Peppa ($26.99) Get ready for bedtime! This plush doll sings lullaby songs, oinks and even plays a counting sheep game. 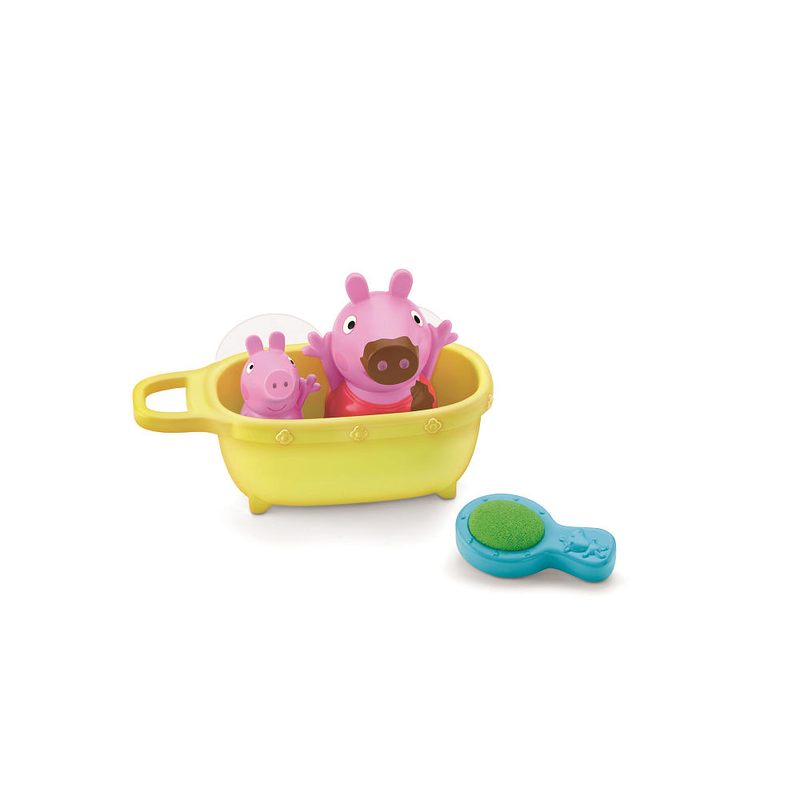 Muddy Puddles Bathtime Peppa ($12.99) Make the bath more fun with Peppa and George! Watch Peppa’s muddy spots disappear in warm water. The set’s storage container adheres to the tub wall with suction cups for easy storage. Peppa Pig and the Busy Day at School hardcover book ($12.99) Follow the adventures of Peppa in school as she learns her numbers, letters and more! Knowing that Bella loves to cuddle, she quickly scooped up the Bedtime Peppa Pig plush doll. When she realized it had sound, she got so excited. In addition to having Peppa Pig sing your little one a bedtime lullaby, she also oinks and plays a counting sheep game. I ended up having to pick up another one of these dolls for Savannah, as Bella wouldn't share, and toted it everywhere she went, including her bed at nighttime. While Bella took to the plush toy, Savannah, our book lover, couldn't stop flipping through the pages of this new hardcover book from Candlewick Press. If you follow my blog, then you have probably seen my other Peppa Pig book reviews, which all came from Candlewick Press. This new hardcover book, is filled with two fun-filled Peppa Pig adventures, that follow Peppa and her friends at school, as they learn numbers, letters and have to show off a special talent. What will Peppa's talent be? You will just have to pick up a copy of this book to find out. :-) And, don't forget to have crayons on hand, as the book jacket of this new release turns into a coloring poster -- which both my girls thought was the neatest thing. Now, we have their Peppa Pig work of art displayed prominently on the the front of the refrigerator, while this book is on Savannah's nightstand for easy reaching, as it has become a must read every night at bedtime. :-) Savannah loves pointing out the different characters and objects, as well as practicing her letters and counting. This is definitely a must have book for that special Peppa Pig fan in your life. As for the Muddy Puddles Bathtime Peppa toy, I was a little disappointed with it. The toy set comes with a Peppa Pig figure, a George squirter and a washing brush and bathtub storage container. As a parent, I loved the bathtub storage container, as it helped keep all the items to this set in one place, so we didn't have to hunt for missing pieces come bath time. The mini George squirter is a favorite of both girls, but they struggle at times to wash off the muddy spots on Peppa's nose. Maybe the warm water has to be really warm. But, the temperature we have in the bath doesn't seem to make the spots disappear magically, like it should. Instead, I have to run the brush under hot water and remove the spots myself before handing Peppa back to the girls. In addition to these new Peppa Pig toys, there is also a fun new app available, "Peppa Pig's Sports Day." We downloaded this app the day it came out, and it has since become a favorite of the girls' apps. "Little ones can play on-the-go with the new Peppa Pig's Sports Day app by P2 Games. This interactive app includes six sports-themed games featuring Peppa and her friends, plus a bonus digital sticker book." Geared towards children ages 2-6 yrs. old, this app is now available for download from the Apple iTunes store, as well as at Amazon for only $4.99. Like I said, my girls love this new app, especially the digital sticker book which keeps track of all the stickers they earn from completing different games. Since downloading, they continue to play this game on a daily basis, and haven't grown tired of it yet. It was so nice to see another Peppa Pig app released, as the girls just love these fun filled apps, which are not only entertaining, but educational, too! These new Peppa Pig toys can now be found at your local Toys "R" Us, as well as their online store, just in time for the holidays. The toys all looks so great - gives me ideas for Christmas! My kids are really big fans of the Peppa Pig apps, and Sports Day is their favourite, too!